“T.A.E.” stands for Total Asian Experience, a series of blog posts that started almost three years ago. 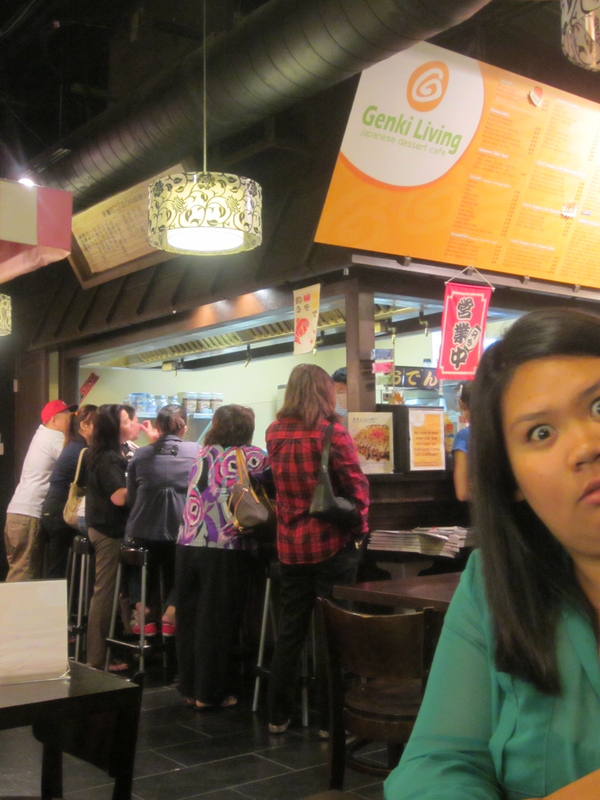 A total Asian experience would be a routine of activities every time we go on a ramen run in Hacienda/Rowland Heights. 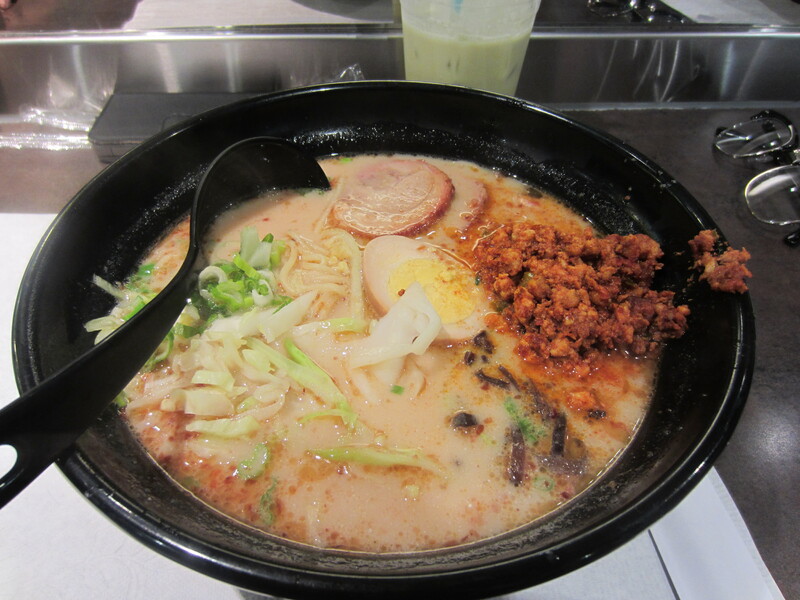 After having average ramen in San Francisco, I really needed to “goodly corrupt” my taste buds with better ramen. This past Sunday, my friend Angie wanted to take Matt and I out for ramen to celebrate our birthdays. I just had my birthday last week and Matt will have his later this week. 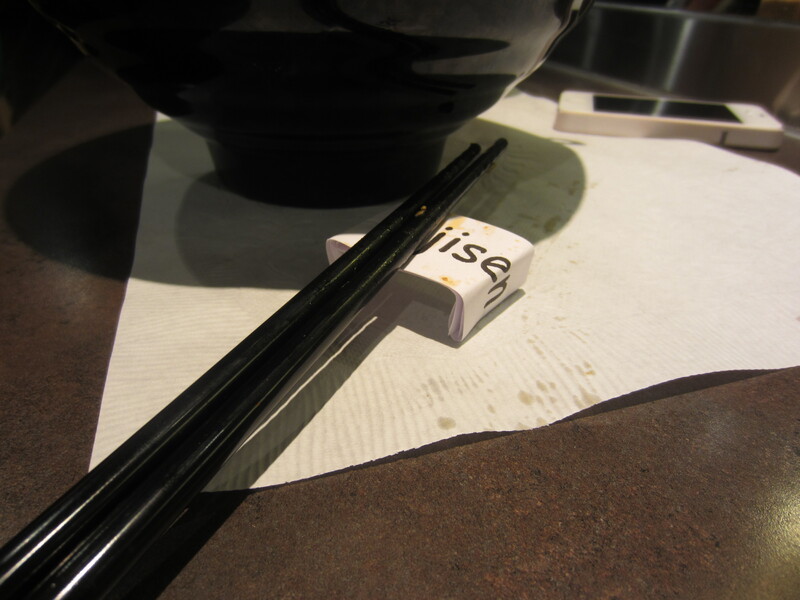 We went to Ajisen in Rowland Heights. Where the magic happens. View from bar seating. 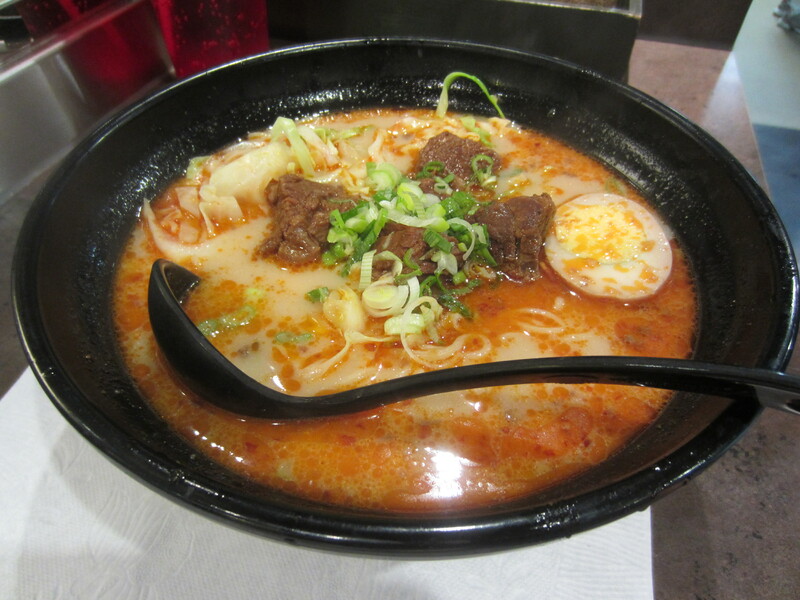 Angie and I ordered the Ajisen Spicy Pork Ramen and Matt ordered his usual Spicy Beef Ramen with egg. The first sip felt like I was rescued from the turmoils of mediocre ramen. My tastebuds were pleased. I don’t care how “mainstream” and untraditional people think Ajisen is. 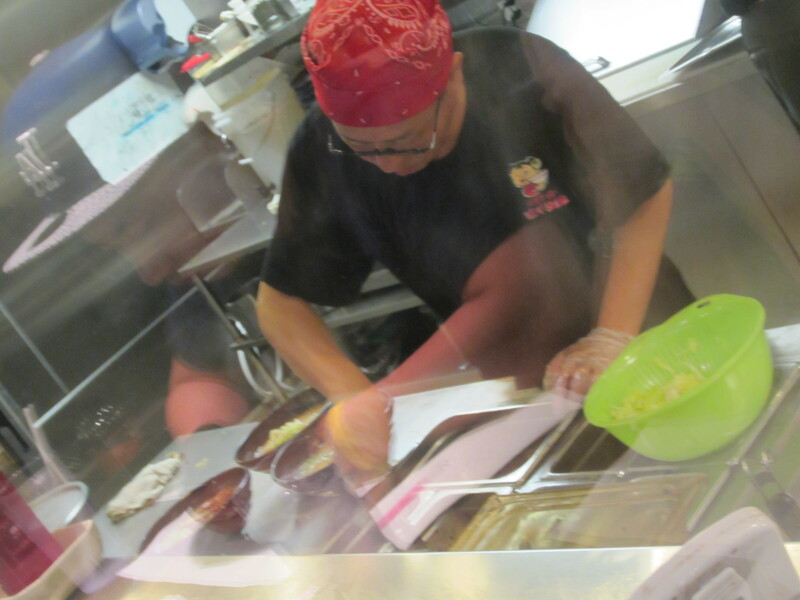 Their ramen is one of the better ones in the area and they have always been consistent with their quality. The noodles were chewy, the broth was very tasty, the chashu was flavorful and tender, and rest of the toppings were great! (And they don’t have bamboo here… YES!) I’ve never ordered their spicy pork ramen before and I loved it. From levels 1 to 3, the spiciness would be about level 2. The reddish stuff on the right side of the bowl was the spicy ground pork. Mix the ground pork around to fully enjoy a spicy broth! Be warned… they use MSG! 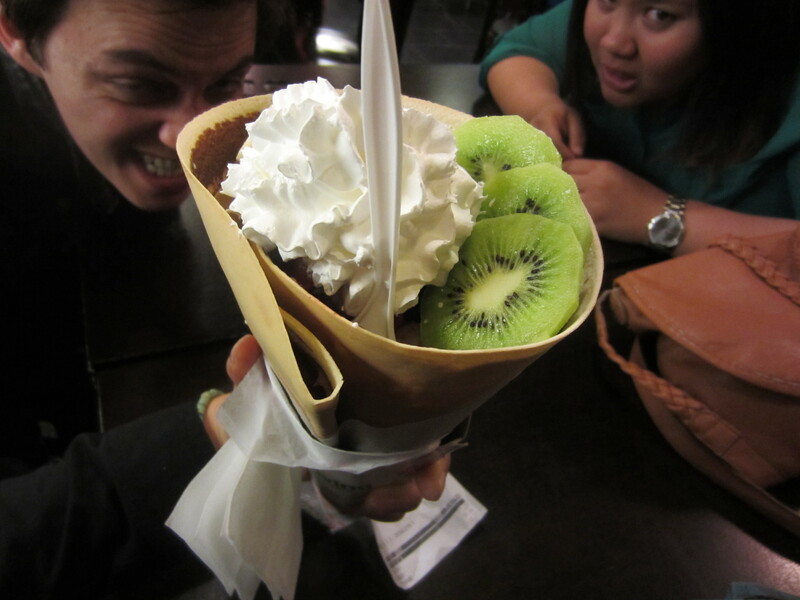 We continued our evening at Genki Living, just a few blocks north from Ajisen, for some dessert crépes. Don’t forget to bring cash if you ever come here! 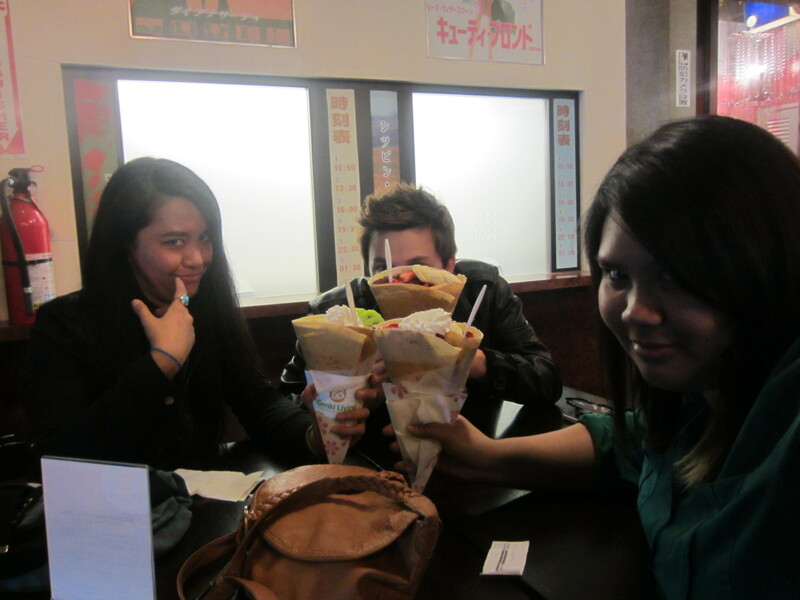 Creeps… I mean, CRÉPES UNITE! We topped off the evening with a photo session at CUE!, just upstairs from Genki Living. We always seem to show up a little before they close at 10 pm. 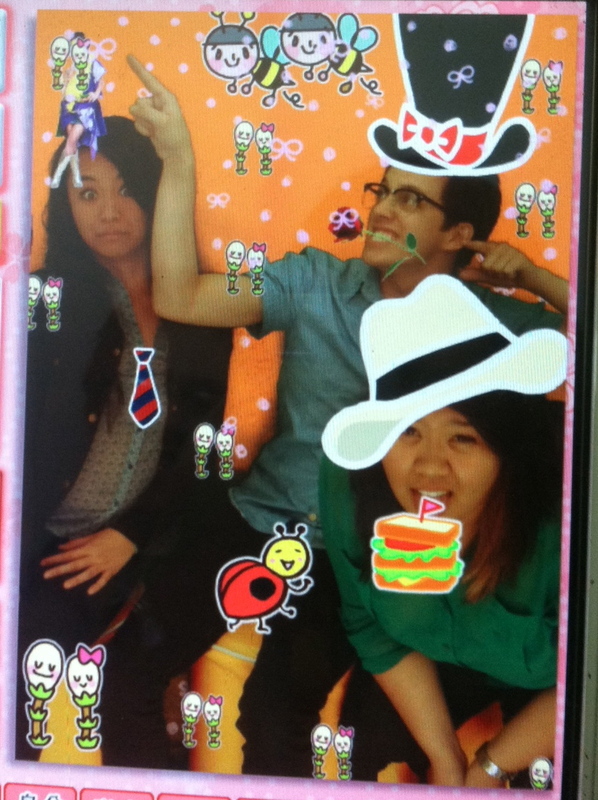 The photo booths have timers so make sure you think fast when you take photos, make your selections, and decorate! The employees there will shut you down! Bring cash here too. 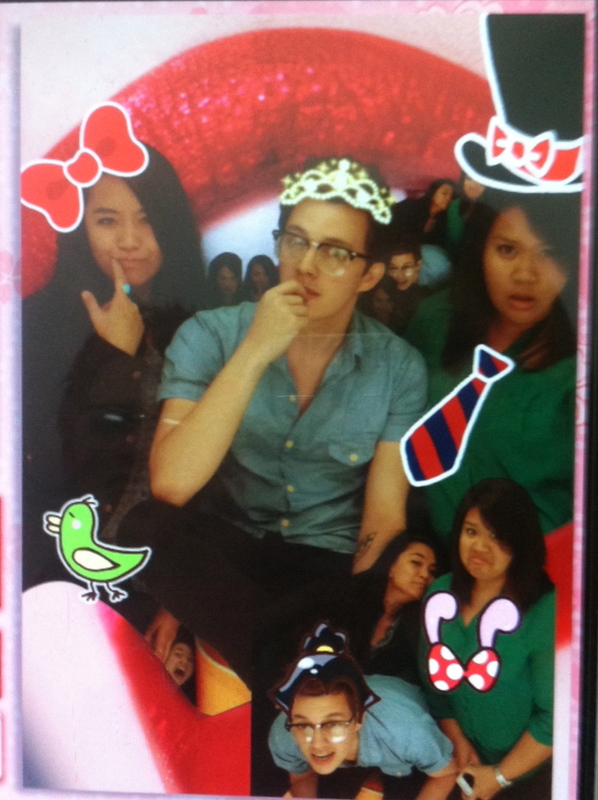 Matt the princess. Angie’s bra looks a bit small, don’t you think? green stem looking thingies are supposed to be? 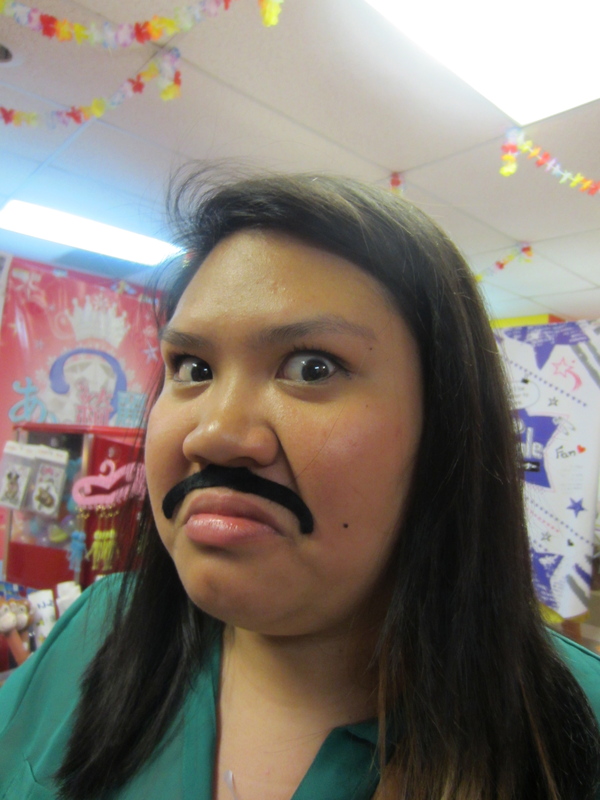 Excuse me Angie, I mustache you a question! What a fun night! Thanks for the birthday ramen Angie! 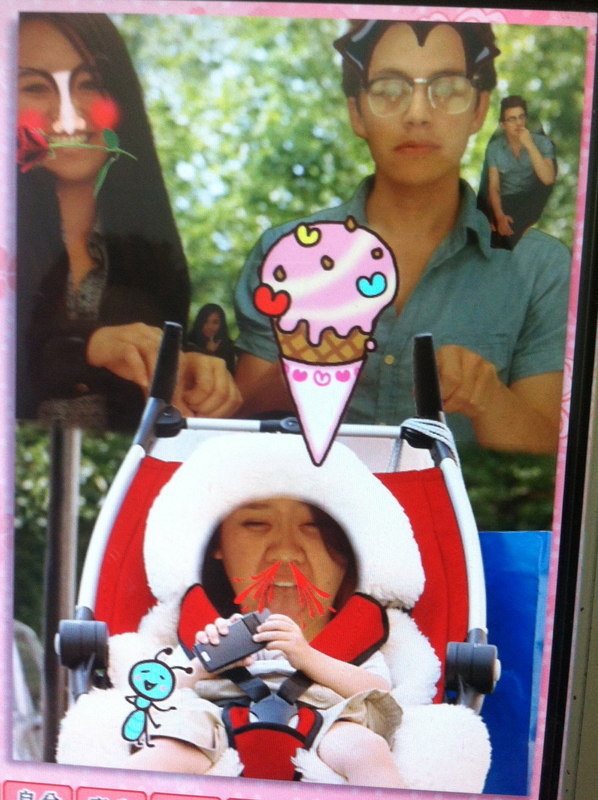 And stay tuned for another episode of Total Asian Experience! Ajisen is located in a shopping center, on the second floor. There is free parking around the buildings and also has its own parking garage. This entry was posted in Ajisen, Food, Hacienda Heights, Japanese, Matthew Jude band, Ramen, Ramen Run, Restaurant Review, Southern California and tagged Nutella, Rowland Heights California. Bookmark the permalink. Those white faces are horsetails which we see in Spring in Japan. They are eatable too. They have those stamps because it reminds us of the spring season. Thanks Atsuko! That’s really cool! We would have never figured that out. Hehe! i love ajisen! the first time i tried was in China! haha I live close to nyc and about a year later I found out that they have two here in nyc and I go there quite often. I never had ramen from other places but this place is so good I can’t imagine other places to be better! 😀 have you tried any ramen places in nyc? Yeah, Ajisen is one of my go-to places! 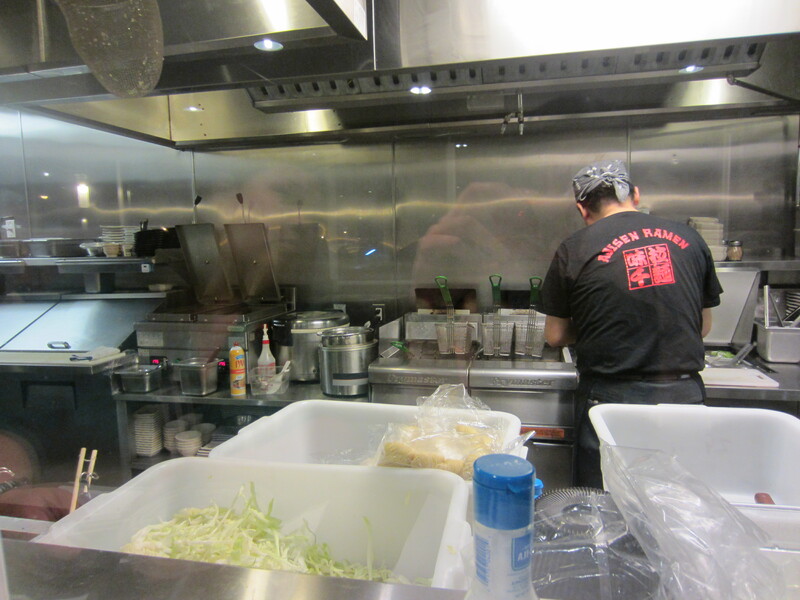 I have not had ramen in NYC, but we definitely plan to someday! I hear NYC has good ramen joints too!